Don and I have spent the last decade developing programs of instruction that would benefit those who need to make tough decisions under pressure. We have worked with the military, police officers and security professionals as well. The Adaptive Leadership Handbook: Innovative Ways to Teach and Develop Your People is a compilation of these efforts. We chose to write this book because we wanted to share the information we know has value in continually improving individuals and organizations speed and maturity of decision making, while at the same time developing a gung ho, working together culture that is focused on lifelong learning while reaching successful outcomes in the most extreme conditions. Introduced briefly are two concepts that may be of future interest – including elements of our Train-the-Trainer course and After Action Reviews (AAR). AARs are conducted at the end of each training session and use the trust built within the teams to clearly and productively critique the decisions made, rather than the decision maker. The underlying concepts and training materials are quite simple however the method of facilitation is more complex. The following proposal contains a program overview specific to the Adaptive Leader program both Adaptive Leader and LESC offer, and is similar one that has been done for the Baltimore Police Department, smaller Police and Security Organizations, as well as the US Army and Marine Corps. The late Col. John Boyd was constantly admonishing leaders in the United States to remember that in the field of human competition the three most important determinants of success are People, Ideas and Things – in that order. Identifying and developing good leaders is the first obligation of any large organization – without those leaders the best ideas will not emerge and cannot succeed. Organizations are already full of potentially brilliant leaders and entrepreneurs who just need to be unleashed on the problems and opportunities a competitive economy presents. 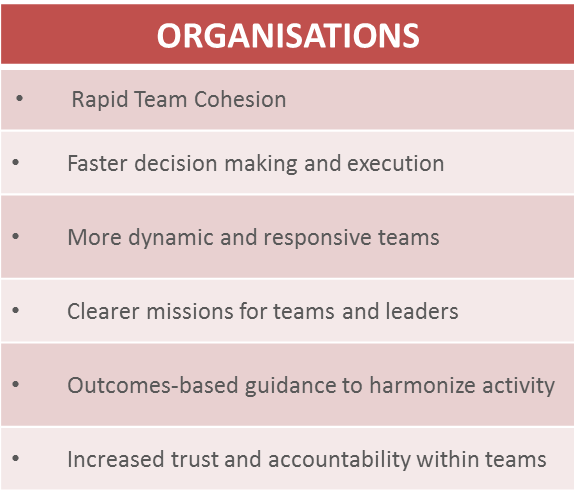 The Adaptive Leader program imparts the concepts and skill set necessary to become an adaptive organization – balancing the harmonized effort of the traditionally centralized structures of a large organization with the individual leadership, initiative and creativity found in smaller organizations or the start-up culture. Empower leaders within your organization to seize opportunities and react to threats as they emerge. The two-day Adaptive Leader Program is an exciting first step on the road to creating a fast moving, adaptive organization with dynamic and courageous leadership. We use proven learning methodologies to ensure participants stay fully engaged and involved throughout the two-day session. Our workshops are filled with interactive Adaptive Decision Games (ADGs), peer assessment and lively analytical discussions creating a safe yet challenging environment for all participants. The course runs non-stop, creating a fluid and engaging learning environment. Participants are always in a situation conducive to the development of personal initiative, team work and adaptability. Everyone takes an active role in the course. This may consist of learning how to evaluate peers during Adaptive Decision Games, briefing solutions to the class, or assuming a leadership role during one of the many Adaptive Decision Games. Dave Grossman, a retired army Lieutenant Colonel and author argues that the optimal state of “arousal”—the range in which stress improves performance—is when our heart rate is between 115 and 145 beats per minute. Very few people play in that optimal range. Most of us, under pressure, get too aroused, and past a certain point, our bodies begin shutting down so many sources of information that we start to become useless. “After 145,” Grossman says, “bad things begin to happen”. 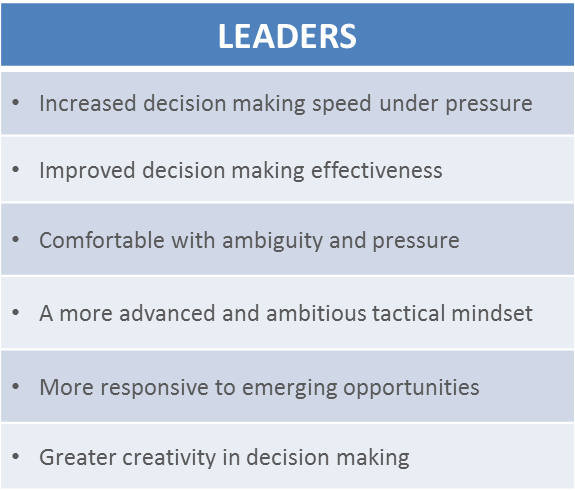 The Adaptive Leader Program deliberately introduces mild stressors into decision-making games, looking to raise the heart-rate of participants into the optimal zone between 115-145bpm. While initially participants might spike above those levels, it is precisely this kind of safe, repeatable practice that will allow them to calmly and confidently confront future real-world challenges. Our approach to teaching with ADGs utilizes Outcomes Based Training & Education (OBT&E) theory, proven to embed and imprint experiences in adult learners. Participants in our course will learn adaptive leadership concepts in their own words and by relating their personal experiences to the principles taught. Only at the end of each session is the concept they have ‘discovered’ given a name. Learning through ADGs builds strength of character in leaders, teaching them how to think rather than the classical approach using “process” and “task” training methods that attempt to teach leaders “what to think”.